There are days where all I crave is cheesy, meaty comfort food which usually results in a deliciously greasy pizza, buffalo wings with cheesy fries or a good old juicy burger. However, that tends to leave quite a heavy feeling in the stomach and a hefty food coma. The next best thing that I have found to satisfy this craving is a creamy pasta. A little lighter but just the perfect pick me up. 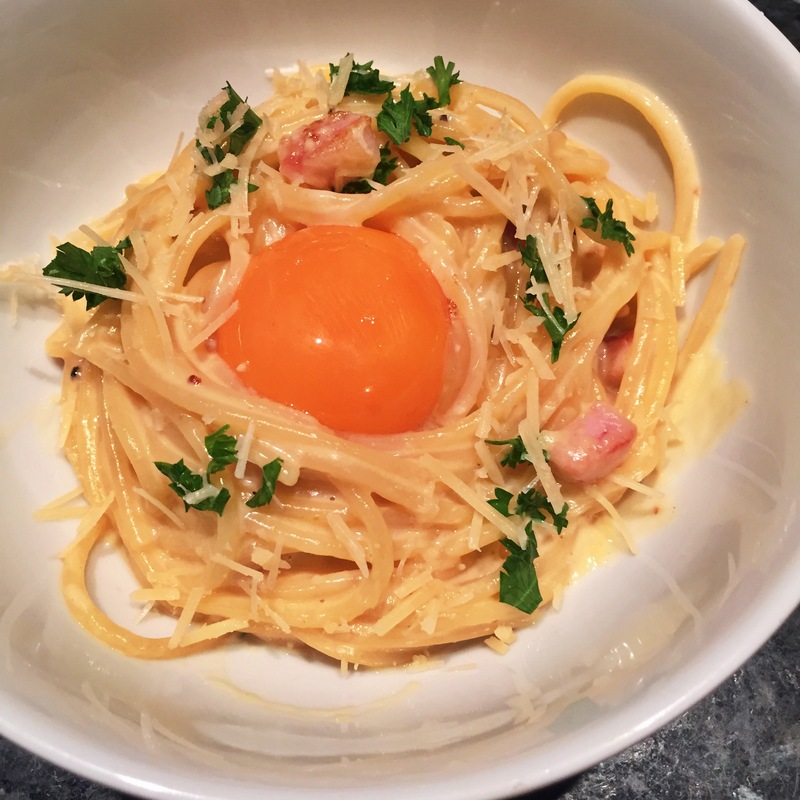 After stumbling across a quick and easy Aussie carbonara reciepe by Jamie Oliver, there was no hesitation to start cooking this dish (with alterations to our tummy’s liking). Boil hot water in a saucepan and pop in the spaghetti until it softens (refer to YouTube as cooking it in the saucepan reduces water wastage and is much much quicker). Pop a dash of oil in a large frying pan and put in the diced bacon. Fry until desired crispiness. Whisk the cream with the grated cheese and two egg yolks until it becomes creamy. When the spaghetti is ready, toss it into the frying pan with the bacon. Don’t worry about draining the spaghetti as the starchy water will mix with the bacon fat making it a little saucy. Stir the creamy cheese mixture into the frying pan, making sure that all the spaghetti gets a little bit of the creaminess. Toss the pasta into a bowl leaving a slight dip in the middle to nestle an egg yolk. Add extra cheese and parsley before serving. The amount of each ingredient can be changed according to taste (less cheese, less bacon – but really, why would you). This dish is so simple to put together but is absolutely mouthwatering. Pair with a wine and you’ve got yourself a delicious night in. I am intrigued by the egg yolk. I have seen this at another pasta place I go and have never gotten it. Yours looks amazing. I might just have to see about getting something similar to this tonight at my favorite Italian Restaurant in San Jose. Yum!